A Chanukah menorah on the eighth night, lit with candles. The Talmud1 tells us, regarding the mitzvah of lighting Chanukah candles: "The House of Shammai says, 'On the first day you light eight, and from here and on continue to subtract [one light each day].' The House of Hillel says, 'On the first day you light one, and from here and on continue to add [one light each day].' The House of Shammai reasons that the Chanukah lights are like the bulls of the holiday [of Sukkot—on the first day of Sukkot, 13 bulls were offered; on the second, 12 etc.). The House of Hillel's holds that, on the contrary,We go up in holiness and not down we go up in holiness and not down." What do the lights of Chanukah have to do with the bulls of Sukkot?2 The question becomes stronger when you realize that if it were not for the notion of increasing in holiness and not decreasing, the House of Hillel would agree with the House of Shammai, that it is because of the bulls of Sukkot.3 What does Sukkot have to do with Chanukah? Some4 would like to answer that it is because both Sukkot and Chanukah are eight-day holidays. But this leads us to another question: what is the significance of an eight-day holiday, and why are these two holidays the same length? The holiday of Chanukah was established because of the miracle that happened with the menorah in the Temple. The Temple menorah had seven lights. So why do we have eight lights and eight days? It seems strange to compare the lights of the menorah to offerings brought on the altar. Firstly, they were two different vessels. The altar was out in the courtyard, and the menorah was in a holier place, in the Heichal (the Holies). This tells us that the menorah was holier, being placed in a holier location. Secondly, when Aaron was commanded to light the menorah, G‑d told him, "yours [the kindling of the menorah] is greater than theirs [the offerings that the princes brought for the altar].5 Kindling the menorah was greater than offerings brought on the altar. Another question: The Talmud6 tells us that the mitzvah of lighting Chanukah candles begins at sunset. However, the menorah in the Temple was lit an hour and a quarter before sunset (at plag haminchah).7 If the Chanukah menorah is lit to commemorate the lighting of the menorah in the Temple, why don't we light it an hour and a quarter before sunset? The main point of Chanukah candles is to light up the darkness. The miracle of Chanukah came after the darkness of the Greek interlopers, who defiled the Temple, and when they doing so, they specifically made a point to defile every bottle of oil8 that was there, by breaking the seal of the Kohen Gadol. They didn't break the bottles or pour out the oil; they merely broke the seals. Because they did this, we realize that it was more important to the Greeks to defile the oil than to destroy the Temple. What was their intention? The Greeks didn't want to destroy us physically.9 Rather, they wanted to sever our connection to G‑d. They had no problem with us keeping Judaism, but they wanted us to do it out of our own free will, not purely for G‑d’s sake. The oil symbolized just that. The whole idea of purity and impurity is something that doesn't make sense according to logic. It is done purely because G‑d commanded. And that is what the Greeks couldn't handle and wished to destroy. Of course, once they started to make decrees, it snowballed into an outright war on Judaism. This is why the miracle of finding the jug of oil still sealed with the High Priest's seal was so significant; it meant that there is a part of us that is always connected to G‑d, never to be severed. Each of us has a neshamah, a G‑dly soul, which is an actual piece of G‑d. This neshamah has five parts.10 The highest part is called yechidah, the essence of the G‑dly soul that is one with G‑d. This is not the way G‑d relates to the world, but much higher, the essence of G‑d, beyond existence. This part of the G‑dly soul can’t be touched by negative influences. But, to the contrary, when we tap into that part of the neshamah, we affect the world around us in the most amazing way, lighting the darkness of the world, not that our light dispels the darkness, but that the darkness itself begins to shine. 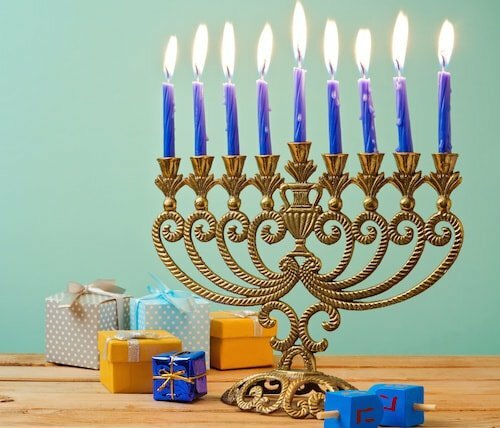 Now we can understand why Chanukah is eight days, and the Chanukah menorah has eight lights. Because Chanukah is about our connection to G‑d that is beyond existence, which makes the darkness itself shine. Sukkot is also eight days long, because it also connects to that which is beyond existence. This is specifically seen in the bulls of Sukkot. Throughout the first seven days of Sukkot, we brought 70 bulls representing the 70 nations of the world. This is affecting the world naturally. By shining our light upon them, we dispel the darkness. In this modality, they don't prevent us from doing what G‑d wants us to do. On the eighth day, we brought one bull, representing our singular essential bond with G‑d, beyond existence, the yechidah, the essential soul. By revealing our essence, we affect the world to the degree that darkness itself becomes light, meaning that the nations of the world actually assist us in serving G‑d. This is why on Sukkot we spend seven days in the sukkah, and on the eighth day, there is no mitzvah to be in the sukkah. For seven days, surrounded by the sukkah, we are surrounded by a great G‑dly energy, but we can't internalize it. On the eighth day, when we connect to our yechidah, above existence, we are able to internalize this great G‑dly energy. On the eighth day, when we connect to our yechidah, above existence, we are able to internalize this great G‑dly energy. Therefore we don't need to be surrounded by the sukkah anymore. May the light of our Chanukah menorah turn the darkness of the exile to light in a way that the darkness itself begins to shine, and usher in the coming of Moshiach. The time has come! Torah Ohr, Mikeitz p. 32d. Ohr Hatorah, Chanukah, volume. 5 p. 942b. Ohr Hatorah, Chanukah p. 204b. 5. Bamidbar Rabbah chapter 15 par. 6. In Halachic hours. See Lechem Mishnah, Laws of Prayer chapter 3 law 2, that the ketoret ( incense) burned for 11 less a quarter of an hour, that is when the menorah was lit (Talmud, Pesachim 59a. Rambam, Laws of Korban Pesach chapter 1 law 4). See Levush and Taz, Orach Chaim, Laws of Chanukah chapter 670 law 3. The five are, Nefesh, Ruach, Neshama, Chaya, and Yechidah. See Tanya for an in-depth analysis. See Shaalot Uteshuvot HaRashba, volume 1 chapter 9. Emek Hamelech, Shaar Kiryat Arba, beginning of chapter 111, p. 108a. Maamar Tanu Rabanan Mitzvat Ner Chanukah 5738, Torat Menachem Sefer Hamaamarim Meluket volume 2 pp. 162-168. How can I be a Jew among non-Jews?